The article is devoted to semantic analysis within the framework of linguistic expertise. There has been developed an approach of interpretative analysis of the semantic and grammatical structures. The latter refers to linguistic units that either 1) exist as a grammatical construction with definite morphological characteristics of the components linked by particular syntactic relation, 2) have certain vocabulary scope of structures: generalized semantics of the model is detailed through a particular lexical implementation, and semantic implementations can be classified. 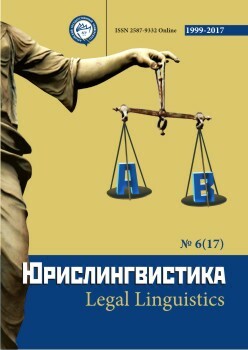 For example, the analysis of specific lexico-grammatical construction «people of somebody» (people of Petrov), which has become the subject of legal and forensic dispute, shows the position on this particular issue and gives grounds to the employment of the approach of semantic analysis of linguistic units in linguistic research for expert purposes. · analysis of a structure with specific lexical content in the situational context and discourse. The mentioned stages form the approach to the semantic analysis of linguistic units of the type discussed above - the semantic and grammatical constructions. To understand these structures is more than just to interpret words, you should take each stage of filling the model with lexical content, and – most importantly – not to skip the stage of possible interpretations depending on the different characteristics of each component (concrete/ abstract, proper/ common, animate / inanimate), and also the style, the general meaning of micro - and macro-context and discourse. Коллективная монография. – Челябинск, 2002. Иваненко Г.С. Три мифа в вопросах экспертной квалификации объективного и субъективного // Юрислингвистика. 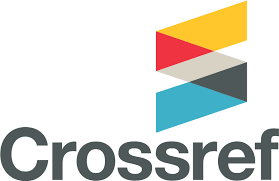 – 2016. – №5. – С.109-131. Иваненко Г.С. Объективное и субъективное в конфликтном тексте: вопросы экспертной квалификации // Acta Linguistica Petropolitana. Труды института лингвистических исследований. – 2016. – Т. 12. – № 3. – С. 311-326. Иваненко Г.С. Текстовые тактики ухода от правовой ответственности при реализации стратегии дискредитации // Вестник Костромского государственного университета им. Н.А. Некрасова. – 2013. – Т. 19. – № 4. – С. 134-137. Кацнельсон С.Д. Речемыслительные процессы // Вопросы языкознания, 1984. Кобозева И.М. Лингвистическая семантика. Изд. 4. – М.: УРСС, 2009. Словарь современного русского литературного языка / М.-Л. : Академия наук СССР, 1957. Guseva L. P., Ivanenko G. S., Kazachuk I. G., Michalska J. Z., Nesterova L. Yu., Pomykalov I.E., Sviridova A. V., Solovyov A. D., Chepasova A. M., Chiganova G. A. Structural and grammatical properties of Russian idioms [Ctrukturno-grammaticheskie svojstva russkih frazeologizmov]. Chelyabinsk, 2002. Ivanenko G. S. Three Myths in Matters of Expertise of Objective and Subjective [Tri mifa v voprosah jekspertnoj kvalifikacii objektivnogo i subjektivnogo]. Jurilinguistics. 2016. № 5. P. 109–131. Ivanenko G. S. Objective and Subjective Conflict in the Text: Questions of Expertise [Objektivnoe i subjektivnoe v konfliktnom tekste: voprosy jekspertnoj kvalifikacii]. Acta Linguistica Petropolitana. Proceedings of Institute for linguistic studies. 2016. Vol. 12. № 3. P. 311–326. Ivanenko G. S. Text Tactics of Avoiding Legal Liability in the Implementation of the Strategy of Discrediting [Tekstovye taktiki uxoda ot pravovoj otvetstvennosti pri realizacii strategii iskreditacii]. Bulletin of Kostroma State University. 2013. Vol. 19. № 4. P. 134–137. Katznelson S. D. Verbal and Cogitative Processes [Rechemyslitel'nye processy]. Problems of linguistics. 1984. № 4. Kobozeva I. M. Linguistic Semantics [Lingvisticheskaja semantika]. Moscow, 2009. Dictionary of Modern Russian Literary Language [Slovar' sovremennogo russkogo literaturnogo jazyka ]. V.6. Moscow–Leningrad, 1957.